An unapologetic love letter to my Dad. I don’t know why you have been on my mind so much lately, it’s twelve and a half years since you died. Perhaps it is watching your small wobbly granddaughter achieving her small significant steps, and hurting that you never met her or knew of our struggles.This morning I saw a bright, quick, robin with worm in beak.I stopped and we made eye contact.I smiled quietly. Somewhere I heard an old story that robins were spirits of loved ones popping back to check up on us. Oh I think this is nonsense, but just like children want to believe in Father Christmas I want to believe in this. A huge rush of memories was undammed by this bright eyed creature, smells, sounds, questions unanswered.So many stories trail behind all of us and you were quite secretive about yours. In white working class Essex, I did not know anyone else whose Dad had been brought up in India, with servants and in what looked like a stately home.Your Great Grandmother was half Goan.With Anglo Indian heritage in what was then Bombay your family did not really fit. Too English to be Indian, and too Indian to be English. How was it for you I wonder? I know you had an Ayah, and that she was too young for the job and gave you Opium to keep you quiet.I’m told this affected your lung development and led to the chronic problems with breathing you suffered from throughout your life.I know you loved your Cook and spoke Hindi to him because you told me suddenly in a rush of memories as we were washing up one day. He cried when you left for England. I expect you did too. You told too about the riots during Independence, and the servants coming to find you in a shop and hiding you in the back until the trouble had passed. This memory when voiced was so precious, so rarely heard that I did not push you for more information and now it is too late. The Hounslow girl who you met at a dance and later married, tells me that your mother was ill prepared for life in a London semi, terribly untidy and that your untidiness was due to servants picking up after you. Who would have thought that a Council House girl and a diffident chap from Bombay would have so much in common? She thought you looked like Clark Gable, she reminded you of Ingrid Bergman.I’m so glad you met, and that the Doctor who told Mum that with your chronic emphysema you wouldn’t make 40 was wrong.I have a particular interest in that part of the story as I was the “autumn blessing”when you’d already got well past the babyhood of the one of each who were already there. I know I get my work ethic, drive and ambition from you.You also passed on a strong faith in God and politics. People found you gruff, and plain speaking to the point of offence at times. Your views were very black and white, there really was no grey. As I hit my teens this was the cause of huge arguments, theological and political. You had been in and out of hospital and had near misses so many times that I was always concerned that I would be the one to trigger, through stress, the final asthma attack. I think we both knew you were too stubborn for that. You haven’t seen them growing up, my children, the eldest receiving university offers. You stood up and cheered at the Free Trade Hall in Manchester as I walked across the stage to receive my degree, the first in our family to do so. When I think of you I am still trying to make you proud, but I know you were proud of us all, Big Girl , My Son and Girlie .No one calls me Girlie now. You would have been proud and worried about my boy, who has struggled with depression and life. When he was diagnosed with Aspergers I was adamant. “He’s not on the spectrum he is just like his Grandad” Oh Dad I think he really is and that you would have been a prime candidate for late diagnosis. As for the Pearlie Girlie, no one could fail to love her, I’m so sorry you didn’t get to meet. Dad you would have been particularly proud of mum. She cared for you so beautifully at the end, after a lifetime of caring. She was determined to keep you at home with the hospital bed in the living room and very little extra help. Driving that road and not knowing whether you would be there when I arrived, in and out of hospital again, but you stubbornly clung onto life. I will never forget the phone call “the terrible day has come” and there you were looking so young and peaceful in the living room while we just had a cup of tea. She has gone on that girl of yours to carve out a life in her community, move house to be nearer us, and start all over again. I see her getting on, but missing you.She still says “we think” as if you have discussed it. I suspect you probably have. In which the past though a foreign country, suddenly hijacks me on the Millennium Bridge. There was a road that led home from my school, a long endless road it seemed to me, although I was much smaller, and my legs much shorter. I walked home down this road every day from the ages of 5 ’til 18, often twice a day when I went home for lunch. I remember small girls thoughts inside my head. Would I always be walking here? Did the Jane of yesterday and the Jane of tomorrow walk along here at the same time as me? Could I one day bump into myself? ( I was a solitary bookish child). I recalled this when I hijacked a works trip to London with Father of Pearl. London was so close to my Essex home, that school trips, gallery visits and teenage forays all started at Liverpool Street station. 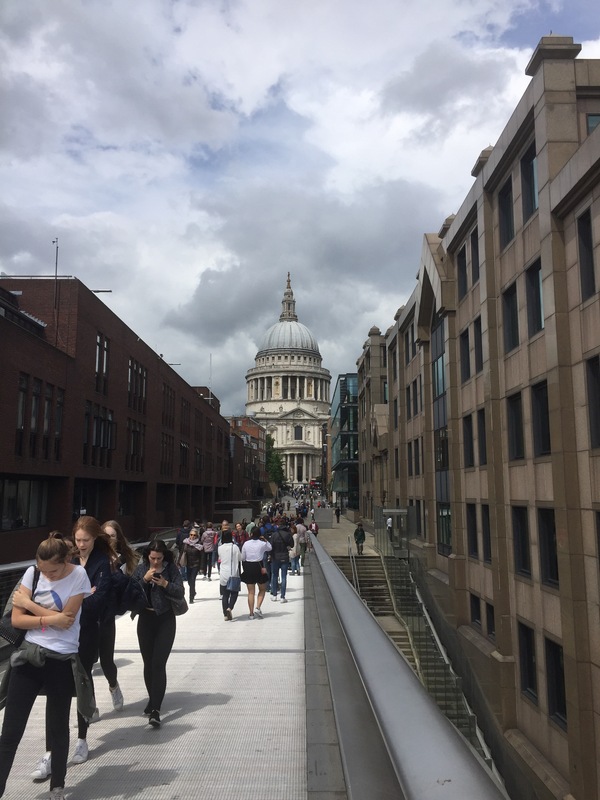 F o P dashed off to his meeting while I moseyed over the millennium bridge to catch a tube to the V & A. I found myself face to face with St Pauls, and wondered if a primary aged Jane crept around the whispering gallery, awed, excited, nervous. I stride, child free and grinning from ear to ear over the Millennium bridge. Briefly I was taken aback and wondered if small girl Jane would believe the world of wheelchairs, special schools and endless fights she would grow up into. Before I had a chance to feel the sad longing for a ‘normal’ life I remembered. I remembered the quiet serious, bookish child, who struggled to fit in. The girl who was concerned to keep the peace so her poorly Daddy wasn’t worried into hospital with an asthma attack. The teenager who always wore the wrong clothes, bought at the wrong shops and who was declared” the frumpiest girl in the school” (oh how we laughed) The sixth former who on a trip to this very London threw up in Covent Garden (something I ate? Nerves? I’ll never know) which triggered a two year battle with an eating disorder which seemed would make her fade away. And then I think of my ‘non typical ‘ life the profession I had to give up, the hospital appointments, statement reviews and filing cabinets of reports. The tired days the worried nights, and I catch myself. I’m happy (and well medicated) confident, loved and in love, with life my jumbley, surprising, unexpected children, my fabulous Northern powerhouse of a husband, with this London – and with myself. Truly. And I remember that the solitary, serious Jane always had a huge capacity to love and was always loved in return. So unexpected though my life has been would I change it? Well some days, yes. On the mornings I wake dreaming Pearl has started to speak I will always feel an aching and a longing. I bend down and whisper to the skipping infant aged Jane ” it’s going to be alright”.